If you read Fridays post on 6 of the Best Circular Mirrors To Consider, you’ll know that we’ve given our interconnecting living rooms a quick update with a lick of paint to the fireplace walls. It’s had us wanting to redesign the whole of our downstairs and there are a couple of reasons why we are holding out. The main reason why we’re restraining ourselves is that we’re doing away with this part of our open plan area to our downstairs. A wall will be going up to create a family snug (ie., the kids get to hang out without us embarrassing grown-ups) and we get a room all to ourselves when we need some time out. Like so many others, when we extended our property 10 years ago, creating an open plan living space of sorts was fine whilst our youngest was little. We could always see what he was up to, well most of the time that is! However, the reality of living in an open plan space does have its downfalls. It’s so easy to forget the practicalities of day-to-day living. 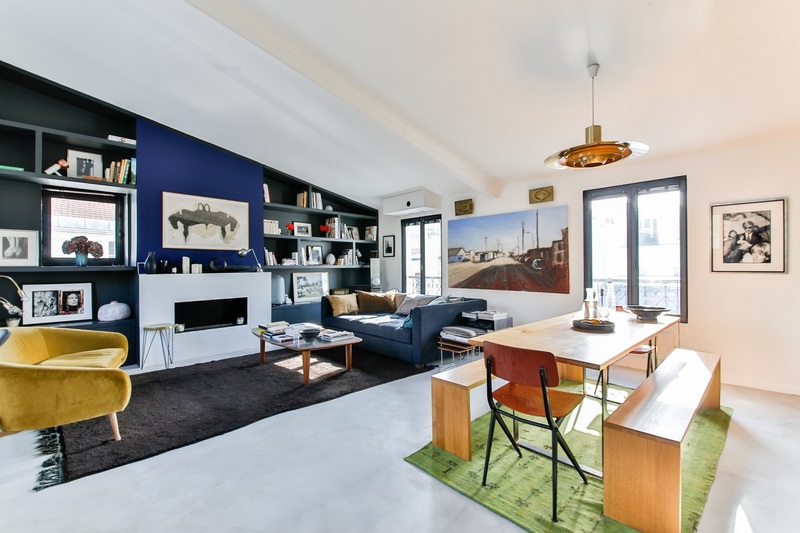 For many, the appeal of open plan whether its to accommodate a growing family or for investment purposes later on when you go to sell has seen huge increases in this type of living. There’s no doubt about it, open plan spaces can bring a sense of space, light, sociability and fluidity to your homes and they do, of course, add the wow factor to anyone entering them. The reality of an open plan space is that you really need to give some real thought and considerations to HOW you and your family are going to live in such a space. Forward planning is absolutely essential especially if you have little ones because they soon grow up and become rowdy teenagers and let’s not forget that they’ll more than likely be living with us as young adults due to the rising cost of renting and buying. Either way, when they start bringing their entourage of friends home there can be nowhere for you to escape. Whether you have children or not, we all need some you time where we can sit and relax and read or watch your favourite tv program in peace. 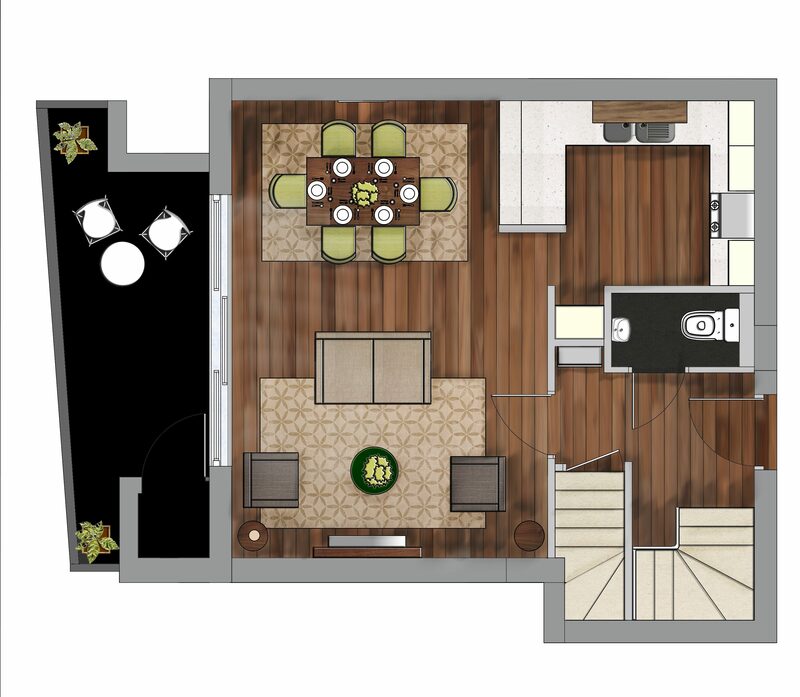 In an open plan living space that can be hard achieve with so many activities going on. So today’s post is for those of you contemplating knocking down those walls or if you’ve done so already how you can make your space work better for you. The more walls you take down the more problems you’ll encounter. SOUND – you’ll create a sound box. With no walls for sound to bounce off or be absorbed sound travels. The further sound has to travel the noisier your home will be. This is such a big issue with open plan living and if you have little ones and think they are noisy now they get a lot louder as they get older so you may want to check out my post here where I’ve focused on how you can manage it! With fewer walls, your spaces may become bland and uninteresting with nowhere to hang your family photos and art. 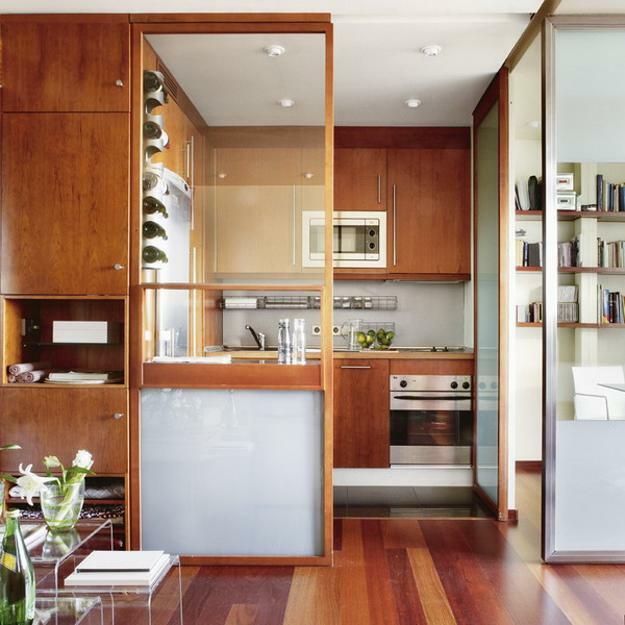 When you take away internal walls, add in the windows and doors you may find yourself with little wall space and nowhere for storage to be incorporated as we tend to use the vertical. Privacy is a big issue as you’ll be together all the time and it can be difficult to live in one big open plan space with nowhere to spend time just relaxing. Speaking from experience as a parent, this can be difficult as you seek to carry out whatever you’re doing with constant interruptions as you’re on view ALL of the time which basically means you’ve nowhere to hide! 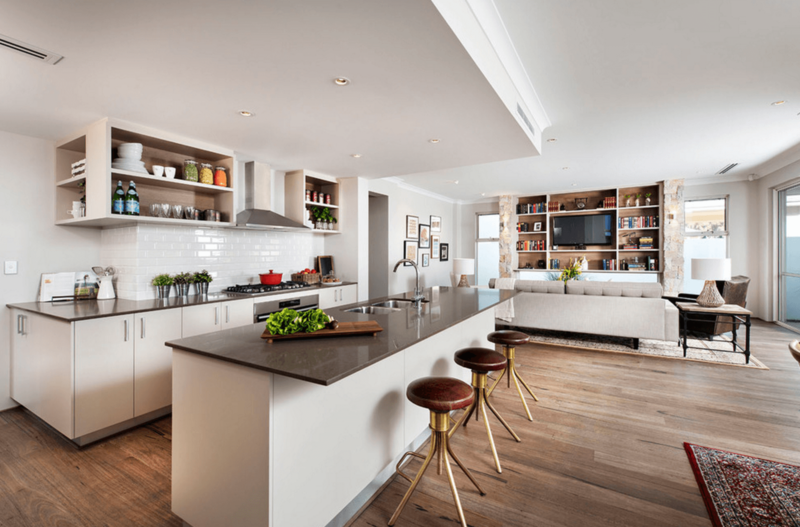 If you’re in the process of renovating your home and opting for an open plan living space then you need to ensure that you plan how you and others are going to use it. 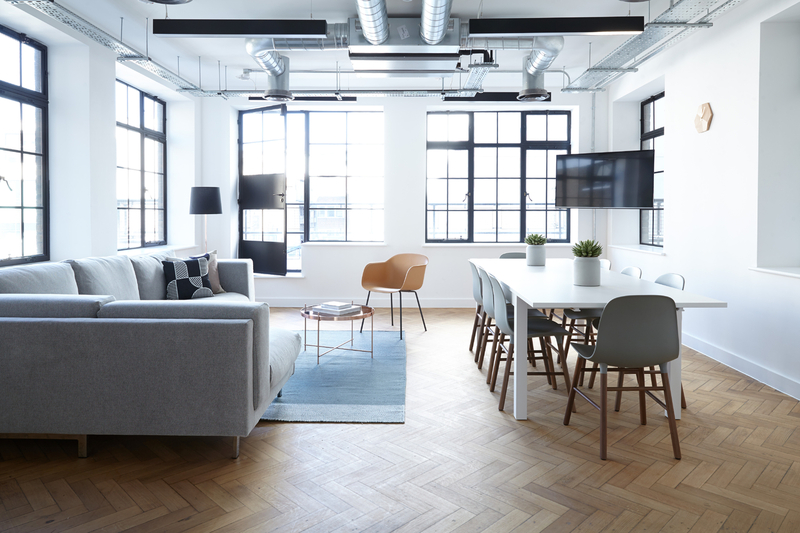 This means ensuring furniture doesn’t block the flow of movement throughout the space as well as taking into consideration doors opening and closing and access to things such as windows. Something as simple as planning your seating arrangements can make a huge difference. Here the living area has been designed so that the main seating area is facing away from the kitchen area which helps if you haven’t done the washing up and just want to relax and not worry that you can still see the pots and pans from your supper. 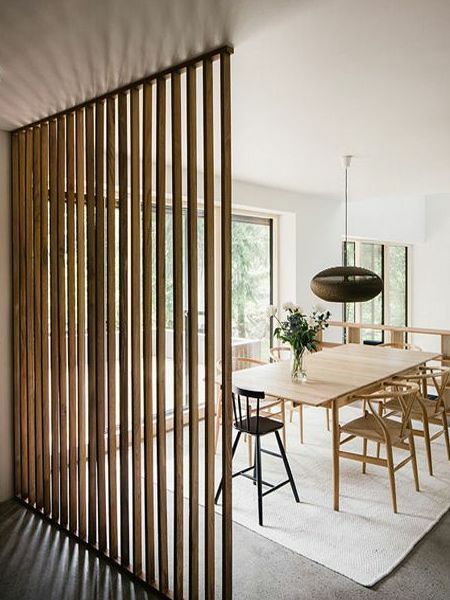 Sectioning off areas such as your dining zone with a screen like the one above will allow light to still filter through and also create a little more privacy and intimate areas. This idea is perfect if you or your kids want to study without distractions from other areas. Whether your lacking storage or want to reinforce zones, floor to ceiling shelving units offer a solution to both. 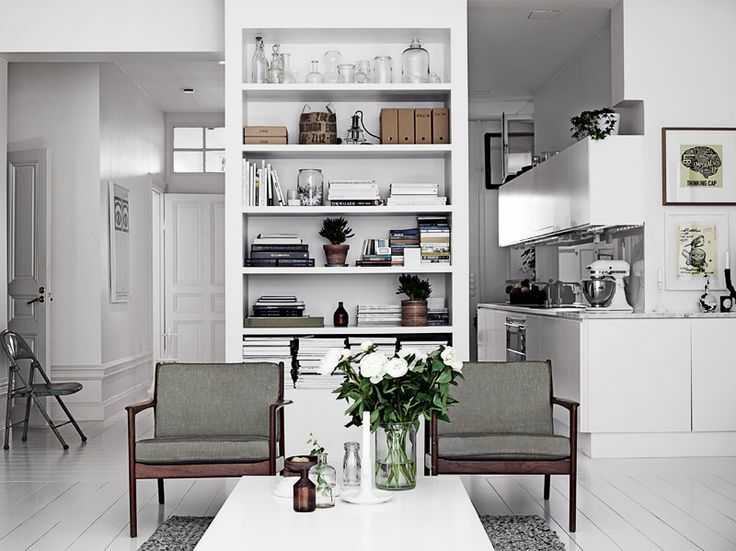 Maybe consider open shelving like the one above, which allows light to filter through whilst being practical. You’ll also be able to show off your personal accessories and make your space more homely. Keeping some walls in place can help you create zones and block out areas such as kitchen areas and help create quieter zones. Without walls, sound travels further so keeping some in place can be helpful at keeping noise levels down especially busier areas such as kitchens. They’re also great for furniture placement and allow for storage such as shelving. 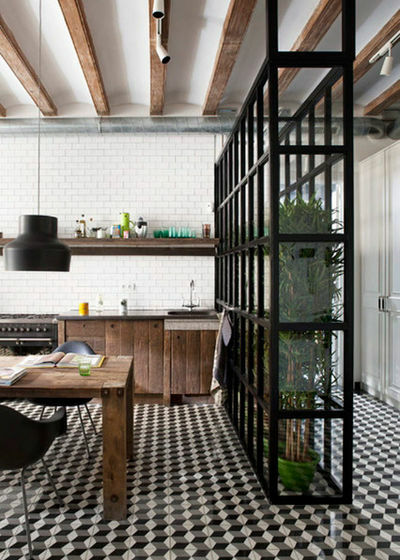 In this case, the shelving and the wall will reduce sound from the kitchen and vice versa from the living area. Even the smallest of walls like this one above can help you achieve a sense of separateness from other areas within an open plan space. The smallest of open plan spaces small areas like this one above has managed to find a place to sit away from the busy dining area with its window seat overlooking the garden. It’s worth considering adding an area that allows you some privacy no matter how small! 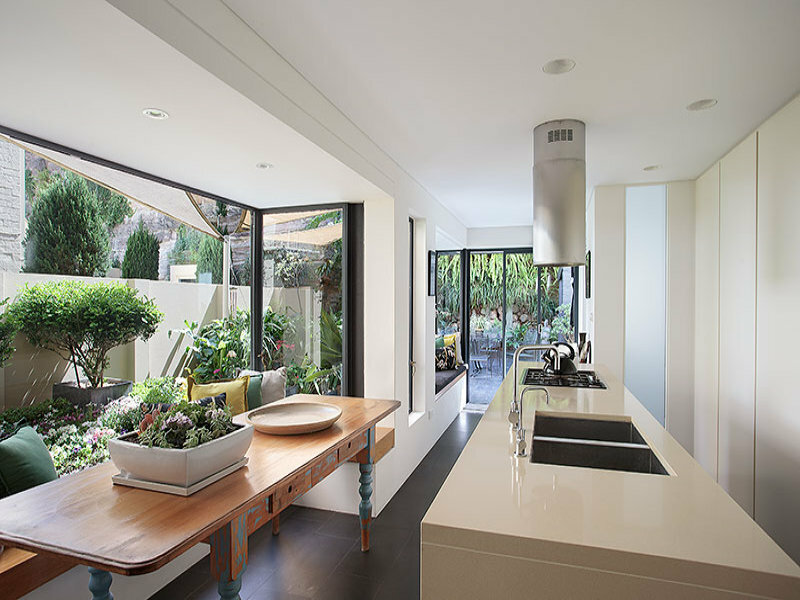 Sliding or folding doors offer you flexibility. 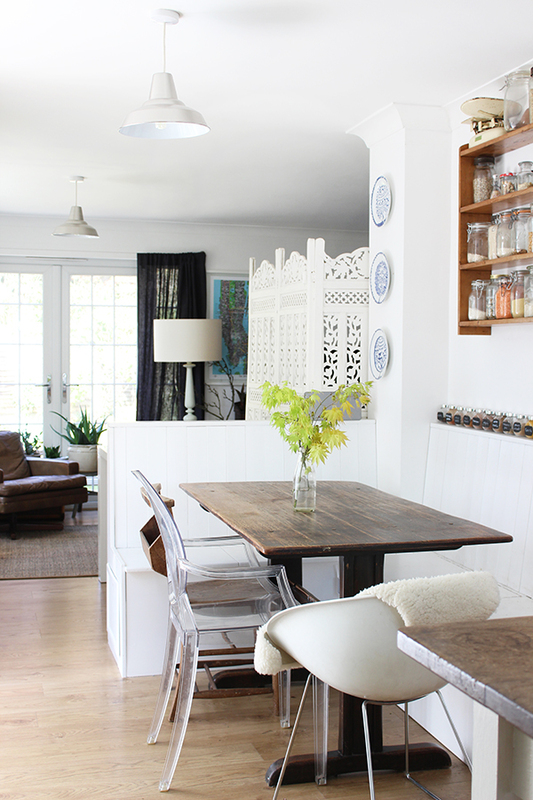 Perfect for screening off the kitchen area where you can avoid smells lingering and the visual mess before and after. This is particularly great if you’re having friends around for dinner. 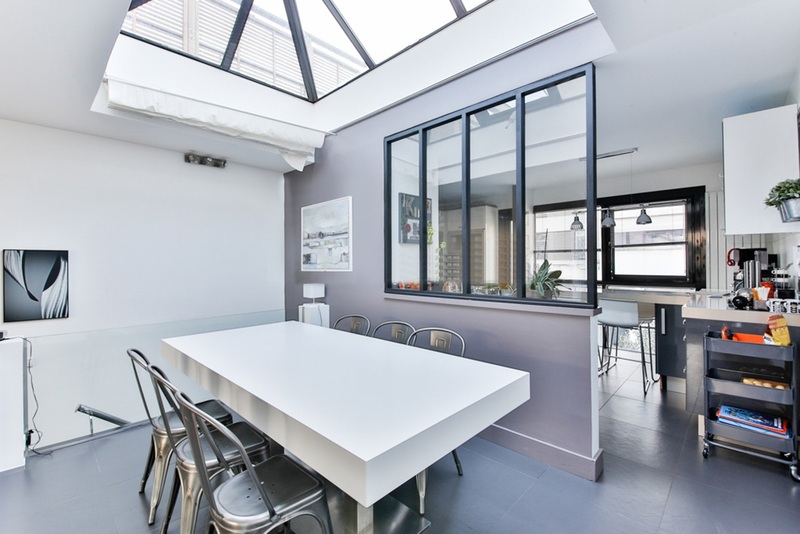 If you happen to have a larger open space you may want to keep the sense of light by using glass windows and doors to section off small areas to work or relax in all together. Thanks for stopping by today and I’ll see you again next week!